Wolfenstein: The New Order destroyed my expectations, in 2014. I was expecting a mindless hyper-violent shooter but what I got was a hyper-violent shooter wrapped in a cohesive and compelling storyline. Hardly surprising when you realise MachineGames, the developers of the current gen Wolfenstein, is made up of old Starbreeze employees. The Chronicles of Riddick: Escape from Butcher Bay, for the original Xbox, first displayed their knack of storytelling within a first-person perspective, and then The Darkness showcased this again in the early days of the 360. Both of which didn't get the attention they deserved. Wolfenstein II: The New Colossus is a Continuation of the highly underrated 2014 Wolfenstein: The New Order. After your last fight with Deathshead, where you were left half blown up, you're rescued by your surviving mitkämpferen. They patch you up and remove what's left of your organs and then you spend the next few months in and out of a coma, where your dreams are used to quickly fill the player in on the events of Wolfenstein: The New Order. You're rudely awakened by a squad of Nazis that have been tracking the Submarine, that your rebel allies have all been using as a home and a base of operations; ever since you commandeered it in the first game. The U-boat, Eva's Hammer, acts as a sort of hub between levels. It's quite a large and highly detailed environment, with ridiculous amounts of pipes and flashy things, a canteen, science lab, chill-out bar and everyone's living quarters. Each cabin is filled with tiny details to tell a bit about each character living on the U-boat. Except for people outside the core group... they get to live on the floor, in the corridors because their in-game model has a lower polygon count and their lip syncing is slightly off. The böse Miststück, Frau Engel has a personal vendetta towards William "B.J." Blazkowicz, after you blew half of her face off and killed her toyboy lover, Bubi, during the events of Wolfenstein: The New Order. She's now promoted to General Commander and is quite happy to order her men kill you, any way possible. Luckily, you're der tapferer Mann mit eine großen Waffe und the game has some pretty dumb AI that will run over a pile of their buddies dead bodies and head straight at you. Allowing you to just funnel the enemies through a doorway and dual weapon them until they stop coming. The story touches on a lot of heavy and hard to cover the subject matter. 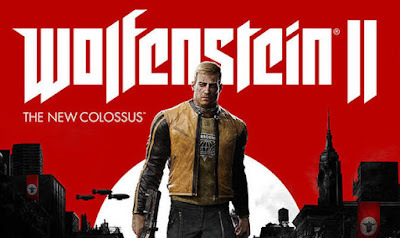 Obviously, there's the Nazi and white supremacy as the main story narrative but the game also flashes back to Blazkowicz as child, a few times, and you learn of his suffering with domestic abuse from his father and the time he was forced to go all Old Yeller on the family dog. This isn't the only case of domestic abuse, in the game, either. Sigrun is harshly treated by her Mutter, Frau Engel. Each area is full of collectible items to help fill in back stories and the world they live in. The game often seems confused, as to, if it wants you to run around frantically shooting everything or be taking your time to find a hidden art card wedged between two desks. You can easily miss a pickup, whether it be ammo, health or a collectible, as the detection box is annoyingly small. Your sights need to be directly over it, which isn't easy mid-battle and you'll often end up finding things, after a shootout, that would have come in pretty handy two minutes ago. Mick Gordon returns to make another one of his drop string, guitar-heavy and moody soundtracks for a Bethesda title. His work on last year's Doom was not only fitting to the game's design but the way the dynamically changing music played out to the carnage on screen, would help amplify the visual energy. MachineGames got to focus on a story driven and single-player experience with no needlessly tacked on multiplayer to district from their development time. It seems odd that, with all the attention to detail, Blazkowicz doesn't make any visible splash when he jumps into water…. The ripple effect is nice though. Anfangen ist leicht, beharren eine kunst.